The foul siege reached from Sarasota nearly to the tip of Florida by early June, when ecological insult No. 2 arrived. A green film of cyanobacteria appeared, as it regularly does in summer, in vast Lake Okeechobee. But this year the bacteria also spilled over into rivers and canals, which carried the toxic green sludge east to the Atlantic Ocean and west to the Gulf of Mexico. Already distressed Floridians gagged on the noxious odor, and more than a dozen people reportedly went to local emergency rooms after coming into contact with the contaminated water. Some wept as beloved manatees expired, bloated and tinted a ghastly green. One tourist warned on TripAdvisor: “Ground Zero — Polluted, dirty, unhealthy beach — STAY AWAY!! !” And the top experts on toxic algae blooms said they had no idea when the onslaught would end. The combination of a wave of dead sea life from the red tide and the sickly stench from the blue-green algae, which can drift several blocks away from the water, is hard for locals to ignore. “Many people will tell you that this is the worst they have ever seen,” said Jacylin Bevis, a reporter with WBBH-TV, the NBC affiliate in Fort Myers. “It’s our entire south Florida coastline with the red tide and then with the blue-green algae on the rivers and canals." The siege mentality has been exacerbated, because Floridians don’t feel they can turn to their regular refuge in broiling summers. “Living in South Florida in the summer and not having the beach as option is not a great place to be,” Bevis said. In fact, while this year's red tide may be prolonged, it is no worse than those a decade ago. The history of ocean contamination and the blue-green algae infestations that taint the state's interior are complex, and distinct. Historians have found accounts dating to the 1500s and 1600s of what may have been blooms of Karenia brevis, the self-propelling microorganism that masses in the Gulf of Mexico to create red tides. A Franciscan monk in 1648 described the foul odor from dead fish piled onshore. The red tides seem to have increased in frequency and persistence over the last 20 years, though the historical record is too sketchy to say whether the events are really more prevalent. The current episode arrived in November and has lasted for nine months. 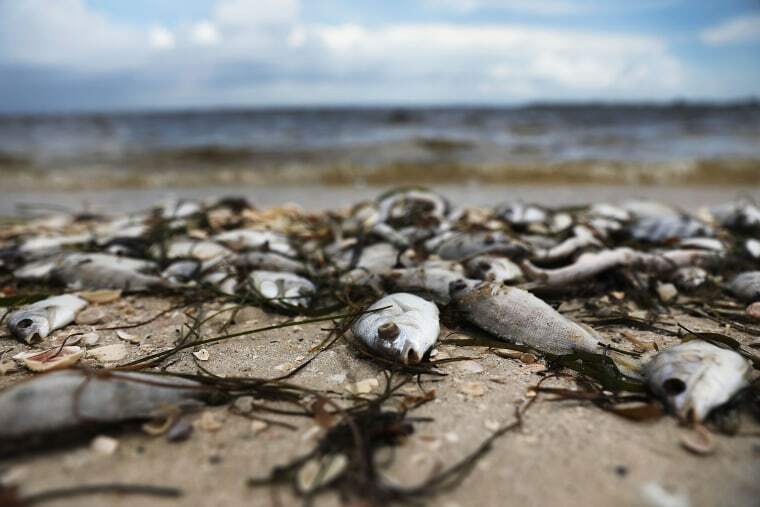 That does not yet approach the 17-month red tide that beset southern Florida from the end of 2004 until early 2006, or the red tide just a few years before that, which didn't dissipate for an epic 21 months. Red tides are hard to ignore because the microorganisms emit brevetoxins, which can paralyze fish gills and permeate the seagrass that is eaten by many other creatures, including manatees. Humans also suffer when the toxins get blown into the air, constricting the lungs’ bronchioles and sending asthmatics and others to emergency rooms with coughs and shortness of breath. Born in deeper water, the red tides are carried to shore by currents and winds. This red tide has spread over a 100-mile stretch of coast, but it is an uneven invasion. The reddish seas wax and wane depending on the day and even the hour, based on conditions. Pollution from inland sources, particularly fertilizers, can wash into the ocean and provide fuel for Karenia brevis. But the tiny creatures have many food sources. “These pollutants could be a part of the problem. We just don’t know how much,” said Richard P. Stumpf, an oceanographer who studies harmful algae at the National Oceanic and Atmospheric Administration. The blue-green algae blooms tainting lakes, canals and rivers in south Florida are a different matter. Key drivers are water temperatures and pollution from humans, according to Tim Davis, a Bowling Green State University biologist who studies algae. Lake Okeechobee has become a perfect petri dish for several strains of microorganisms in recent years, as a proliferation of farmland and towns has spilled nitrogen and phosphorous-based fertilizers into the watershed. The toxic stew was supercharged when Hurricane Irma forced a flood of additional polluted runoff into the lake. Cyanobacteria lapped up the extra nutrients, reproducing exponentially in Florida’s punishing summer heat. The algae produce a toxin that can not only choke animals but in humans cause headaches, sore throats, vomiting, diarrhea and pneumonia. Long-term exposure to some algae blooms has been linked to liver cancer and neurological diseases such as Alzheimer's. But funding for large-scale fixes is scarce. And so much pollution has accumulated in the lake bottom, it would take decades for it to disperse, even if new pollution from sugar farms, dairies and other sources could be shut down. No surprise, then, that the pollution emergency has become a political hot spot in numerous races — including the bruising contest for U.S. Senate that pits Bill Nelson, the Democratic incumbent, against Rick Scott, the state’s Republican governor. Nelson has bashed Scott for slashing controls on polluting farms and businesses. Scott countered that Nelson has done little to fulfill promises to clean up Okeechobee. Scott took at least one definitive action: declaring a state of emergency in early July in seven South Florida counties. That allowed water officials to store water from the giant lake, rather than release more water, and toxic algae, into the state’s already straining waterways. Relief from the twin scourges can’t come soon enough in communities like Fort Myers, where beachside restaurants have closed early and hotels have had tourists cancel. Crabbers are among the many fishermen who say their catches have declined as much as 70 percent. And no one can tolerate the stench of rotting organisms, big and small. Some who plan to attend have said they will wear respirator masks. It’s an effort, said one activist on Facebook, “to show the Nation, even the World, that we are 'suffocating.'" Maya Rodriguez and Kalhan Rosenblatt contributed.